Ram gave its lineup a dose of attitude last month in Detroit with the new 2015 Rebel. 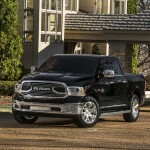 Now it’s bringing a touch of class and sophistication to the lineup in Chicago with the new 2015 Ram Laramie Limited. If there’s one word to sum up the new 2015 Ram Laramie Limited it’s this: bling….